I am a Professor in the Physics Department of the University of Maryland, College Park. 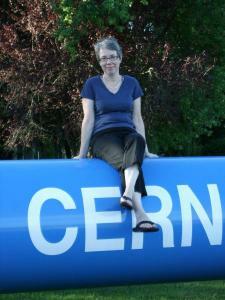 Research: experimental particle physicist, working in the CMS collaboration. Some nice videos from CERN on the LHC can be found here and here. (This one is also accurate, and it rhymes.) See videos that show me talking about my research at this link. Also, here are links to 3 lectures I gave at the CERN/FNAL 2009 summer school (lecture1, lecture2, lecture3). My research has focused on precision studies of the properties of the W boson, tests of QCD using Z bosons, and searches for exotica particles predicted by theories of physics beyond the standard model. I am also interested in R&D and simulations of calorimeters, and their use in measurements of the momentums of jets and missing transverse energy, and studies of radiation hardness of scintillators. The W and Z boson are the carriers of the weak force. While a member of the CDF collaboration, I contributed to the W mass measurement from the '88/'89 data. As a member of the D0 collaboration, using the run I data, my students and I did a measurement of the W and Z cross sections and an indirect measurement of the W width. Using Run II data, we did measurements of the W width, the Z rapidity distribution, the transverse momentum spectrum of the Z, the W mass, and developed a novel method for modeling the recoil in W decays. I have been convener of the CDF W/Z group and convener of the Dzero W mass group. There are many reasons to think that the standard model can not be a complete theory of particles and their interactions. Many theories that go beyond the standard model predict new particles. My thesis was on a search for a fourth generation quark at TRISTAN. I was convener of the D0 New phenomena group during the time that the CDF "eegamma gamma" event and the HERA "leptoquark discovery" were all the rage (1996-1998). A MD student who worked with me wrote a paper on searching for squarks and gluinos in the jets plus missing ET channel. I was convener of the CMS Exotica group during 2007 and 2008. My recent students wrote papers on searches for leptoquarks, stop quarks, and heavy, and long-lived gluinos using data from the LHC. I was co-head of the subgroup of the exotica new particles searc group of the CMS collaboration that looked for new particles that decay to final states that include both leptons and jets from 2009 to 2011. I was a member of the exotica group publication committee during 2012. I was co-head of the subgroup that looks for new particles that decay to final states dominated by leptons and/or photons during 2013 and 2014. These include searches for dark matter using events with containing W's, searches for excited leptons, searches for heavy bosons that couple to leptons, and many other hypothetical particles. I am currently working with others on searches for dark QCD. I am also interested in calorimeters, especially the reconstruction of jets and missing ET. I was the first CMS PRS jets and MET leader (1999-2002) and was a major contributed to the physics TDR, volume II. I was co-chair of the MET group during the commissioning of the LHC (2010,2011). I was chair of the review committee for the Dzero jet energy scale group at the start of run II. I've also done work on detector simulation. I was head of the Dzero simulation group for 2 years and wrote Dzero's fast simulation program. I worked on the D0 program that allows real data zero bias events to be overlaid on simulated signal events. I am currently working on studies of radiation hardness of scintillators. I also worked for a while on the muon system of the D0 detector . I proposed a new scintillator-based muon system for the Dzero upgrade, built a prototype which was installed in the Run I detector for testing. The upgrade was approved for Run II and built. I also calculated albedo rates in the muon system using GEANT, using the simulation to design improved shielding, which was also included in the Run II detector. On AMY, I designed, constructed, and installed the HV distribution system for the x-ray detector. I also worked with an engineer to design an amplifier that went between the preamp and the ADC. I am a "Fellow" of the American Physical Society. I've served on many committees, like the FNAL program advisory committee ("PAC"), the federal high energy physics advisory panel (HEPAP), the executive committee of the APS division of particles and fields (DPF), and various review committees for NSF and DOE. I was US CMS Physics coordinator from 2002-2007. I was chair of the HEPAP "informal working group on the university program" during 2009. I was also co-leader (and co-founder) of the "LHC physics center" at Fermi National accelerator lab from 2004-2007. I was electroweak convener for CDF, New Phenomena convener for D0 (1996-1998), and JET/MET (1999-2002), SUSYBSM (2006-2007), Exotica convener for CMS (2007-2008), and co-convener of the CMS group charged with reconstruction of missing transverse energy, the signature of the "dark matter" particle when produced in hadronic collisions (2010-2011). I was currently the co-convener of the subgroup of the EXOTICA group in CMS charged with searching for particles whose final states are dominated by leptons or photons from 2013 to 2014 and head of the HCAL DPG task force studiying the effect of radiation damage on the jet reconstruction and a member of the he radiation damage task force until 2015. I was also co-chair of the CMS CB Career committee from 2012 to 2013. I currently serve on the HCAL publications comittee.